Custom Curb Appeal is supplying neighborhood associations with Alley Address signs. The signs are 12″ x 6″ aluminum signs with the blue artwork in vinyl. Each sign hangs on the back fence of the home and is custom made with the home’s address. The signs are reflective and easily visible at night. The sign satisfies the city requirement that your house address must be on the back fence for emergency vehicles and city services. It helps the Crime Watch volunteer drivers identify where they are when making notes. Sign cost is $22.00 per sign and comes with 2 exterior deck screws to attach to a wood fence or S-hooks for chain link fences. There’s an extra charge of $3.00 if the homeowner wants Custom Curb Appeal to install the sign. Custom Curb Appeal requires a minimum order of 25 signs to place the order, so if you’d like to have one of these alley signs, please contact Marsha Mayo, the HPNA Crime Watch Patrol Coordinator, at mmayo01@sprynet.com, 972.437.1166. 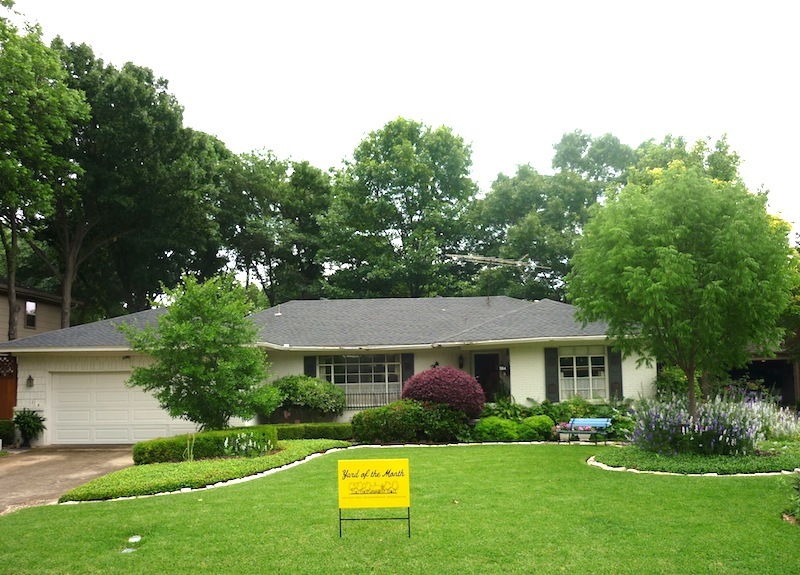 June 2013 Yard of the Month!